10.) Shopping. Whether it's a tailor-made suit, blouse or coat, or counterfeit movies and television series, you can find it here. Cheap. Nearly every town hosts its own market where you can purchase everything from fruits and vegetables to shoes and umbrellas; there are also night bazaars where you can sift through hand-stitched tapestries or if it suits your taste, imitation designer apparel and bags. Larger cities, like the capital of Bangkok, are home to shopping palaces that would wow even the most spoiled shopper with themed floors, elaborate decor and heights towering more than ten stories. 9.) Language. A melodic tonal language as beautiful in sound as it is in script. สวัสดี ชื่อของฉันคือ คิม และฉัน รักเมืองไทย (Hello. My name is Kim and I love Thailand.) In the Thai language there are five tones: low, mid, high, rising and falling; each syllable earns its own tonal attribute, and while spelled the same, the use of tone can considerably alter the meaning of a word. ขาว, said in various tones, refers to either the color 'white', or the foodstuff 'rice' or could also be used as a greeting to indicate the sharing of gossip. 8.) Landscape. With its limestone rock cliffs towering over crystal clear waters, or dense rainforests hidden within rolling hills, the landscape throughout Thailand is breathtaking. It has it all: cityscape, jungles, beaches, mountains and farmland. Best explored by boat, train, tuk tuk, parasail or on the back of an elephant. 7.) Wildlife. You don't have to look very far to see something slithering, stomping or swinging by. The Thai people share their land with elephants, monkeys, snakes, tigers and an assortment of other creatures in near-perfect harmony. 6.) Religious Preservation. Buddhism is the country's most widespread religion, however, in Thailand all religions co-exist and are revered. Temples, monasteries and other religious artifacts dot the nation as abundant as the stars in the sky. Centuries-old temples can be found around every corner ripe for you to explore. Many of the sites continue to house practicing monks and nuns, and invite the community for ritual ceremonies and celebrations. 5.) Bang for Your Buck. Your dollar extends far in Thailand. Currently one U.S. Dollar will buy you a little greater than 30 Thai Baht (THB). With 30 THB you can buy a plate of noodles or stir-fried vegetables over rice. 1,000 THB can get you a decent night's accommodation on the beach. Internet access at a local café is typically 1 THB per minute and four mangoes will set you back 15 THB. 3.) Food. If your palate craves spice, look no further. But adventurous foodies beware: 'Thai Hot' will set your taste buds afire. Traditional Thai dishes that are popular with travelers include: Pad Thai: stir-fried rice noodles with chopped peanuts, Pad Kee Mao 'Drunken Noodles': stir-fried rice or noodles with basil and pepper, and, of course, THE Thai Curry. Thai curry, with its rich coconut milk base and use of fresh ingredients, differs greatly from its Indian cousin, and typically comes in the varieties of red, green, yellow, matsaman and phanaeng. In the eastern parts of Thailand mangoes and sticky rice is a common dish, while at the bar shooting pool you can nibble on a bowl of salted crickets. 2.) Culture. Sawatdi. Unwavering devotion to the King. Thai boxing. Rice fields. Full moon parties. Respect and harmony between the old and the new. Karma. Night bazaars. National Elephant Day. Ladyboys singing on street corners. The third gender. Floating river markets. Long ingrained social customs and norms. Respect for elders. Ramakien. Massage parlors. The Thai New Year in April with water festivals and squirt guns. Temple art and architecture. Street vendors. Ancient Siam. 1.) Hospitality of the People. Where ever you travel within Thailand undoubtedly you will be greeted with a smile and the wai. The wai is the traditional Thai welcome comprised of a slight bow and the pressing of the palms of the hands together in a prayer like fashion. The wai is almost always accompanied by the melodic and beckoning 'sawatdi' which is a pleasant wish of well-being. 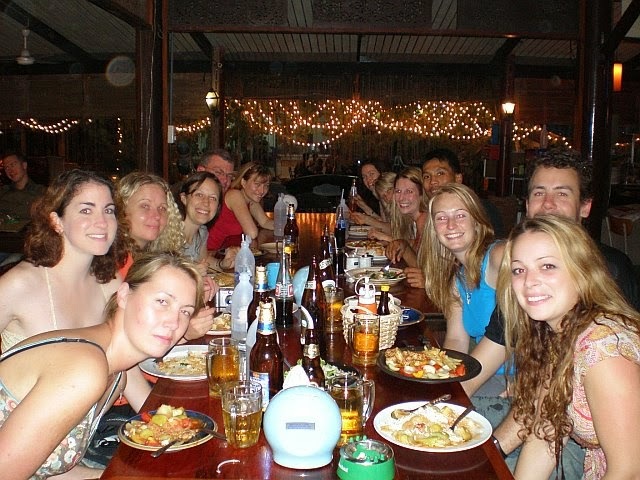 The Thai people are proud of their culture and welcoming to foreigners. Many like to practice their English and to teach you a word or two of Thai. As with every person, in every country around the world, behind each smile, each has a story. If you are fortunate enough to hear it, the story may just change your life.